I'll admit, right from the get go... THIS WAS PAINFUL! My daughter has been asking for a hair cut for a while. My hair was identical when I was a little girl... and I wore it long for most of my life. I have been way too attached to her golden ringlets. I really know this. However, I just wasn't ready. Denying her wasn't right and was way too much about me... oh, but can you blame me? 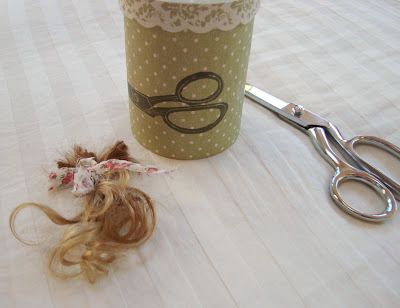 When she begged last week, "cut off all of my curls, Mama... please!" I cringed, but knew it was time to grant her this wish and stop the tears/struggles every time we needed to brush it. We're going slowly... 4 inches seemed to be enough for now. She's happy and feels BIG. Very important stuff for a 4 and 1/2 year old. You know how totally sentimental I am... 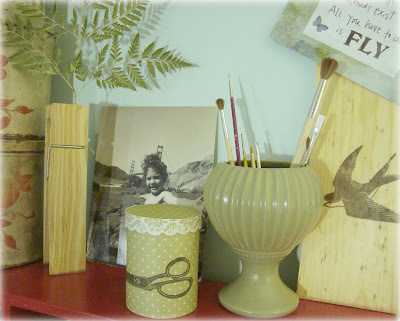 I decorated a little wooden box for those first baby ringlets (see top photo). I was even inspired to carve a stamp for this project. All of the energy I put into making this keepsake helped me immensely in letting my baby grow. There is a sweet spot for it in my ever changing studio. She likes to peek at her snipped hair and giggle. That little girl in the picture behind the box(with the curls)... me. 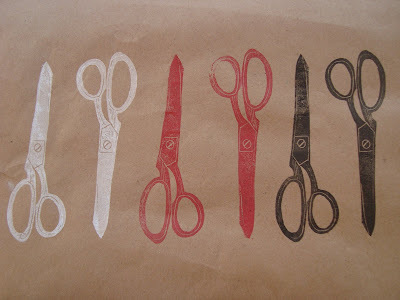 p.s.Don't be surprised if you see more scissor prints soon... I'm loving this stamp! Aww...My mom still has the thick braid from when I first chopped my hair off 18 years ago lol It's a toughy letting the kids grow up. It is so bittersweet. I just gave my baby her first trim (she's 4 1/2 as well) except I had asked her if I could just take the VERY ENDS off. I didn't want to cut very much, and she said a very solid "No." And then she changed her mind several weeks later and got a kick out of seeing the little tiny bit of hair we took off the ends. It's current residence is in her baby book. what a sweet tale. i feel the same twinge each time my wee 4 yr old's hair is trimmed. then last week, the 14yr old cut off his long locks and now looks so much closer to a man... so bittersweet, all of it. the stamp of the shears is great! I never had curls! I allways wanted to have them! The scissor prints are very nice. I printed lately too for the first time.. I think I cut Zoe's hair for the first time at two or something like that. I know I have it documented, but I can't remember exactly. It was a huge step for me too, but it was my decision instead, for better or worse. Oh, I am with you Maya! 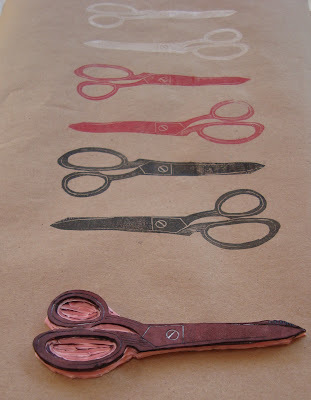 I've been wanting to learn how to carve stamps - did you free hand this design and carving of a pair of scissors?? A lovely tribute to sweet little girlhood! We took photos of my daughter's first hair trim which turned out to be delightful for all us--less tangles. Maya, do you have any suggestions for gentle products or recipes for children's shampoo and conditioner or detangler? Thank you! Your stamp is wonderful as well, did you carve that?! my boy was born with long hair- his first cut was 6 weeks. I kept his copper curls, too. They're in a little ladybug sugar bowl I made. Oh my friend, I know it must have felt so tough to cut (even just a little bit of) these gorgeous curls ... but you made the best of it, and carving the scissors stamp & making this keepsake box was clearly therapeutic & it helped you much. I'm very proud of you ... and can't wait to see more uses of the scissors stamp ! It's just perfect !! what a sweetly documented milestone for her ...and more for YOU! oh my daughters hair looked just like this when she was small! she is 29 now and still has beautiful,thick auburn hair...I miss those little girl days. So much sweetness in this post. It made me hurry off to my "underwear" drawer to check the beautiful little european chocolate boxes with bright colorful designs that I keep the children's golden locks and little bits holding special memories. You're so sweet about her curls. 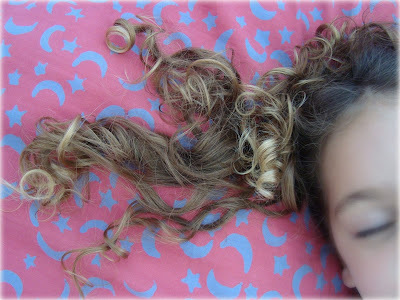 I've been hacking away at my curly girl's hair in the shower since she was 1...bad mother. 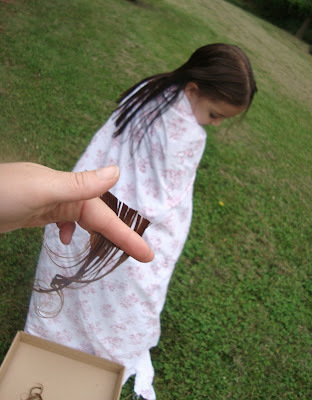 little girls do love haircuts - fortunately she asked you for help rather than taking the scissors into her own hands! i love the scissor stamp and look forward to seeing it in action again. and i adore the picture of you at the beach with the golden gate in the background! 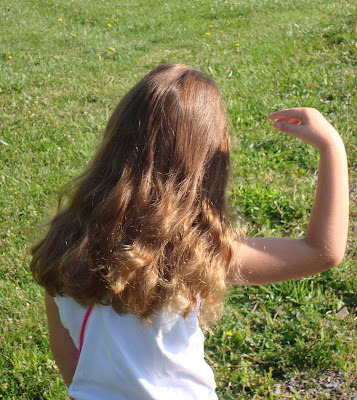 My daughter is three and I'm not ready to cut her curls off. She only has a few - right at the very ends. But, when they do get cut, we'll have to save them as you've done. I think you have been really brave. It's hard letting our babies grow up! I love the way you have dealt with it, the hair-keeper is beautiful, as is your scissor 'stamp'. My daughter will be Four next month and I haven't had her hair cut yet either... but I know I should! ps. And your daughter's hair looks really full and beautiful! love it all, a memory for you of her tender years and for here of breaking into being able to make a decision and...sniff...sniff...growing up. I never had curls and that is what made it even worse for me with my daughters beautiful ones. I feel your pain - my daughter is about the same age with the same ringlets, and as soon as a girl at preschool got a short bob, she was asking for a haircut. we compromised with a few inches and her curls are still there! so we're both happy. my daughter has amazing curls. i'm totally jealous. she'll be 2 in september. my husband keeps saying she needs a haircut. "just a little trim." and i'm all, "no way! you have to get past me first!" Oh dear mama. I had a similar experience with my daughters first haircut. Painful, tears, hoping it was the right thing---that was all me of course. She was ready. She turned to me and said at the tender age of four-and-a-half "Okay, mommy are you ready?" So, all thoughts of ME went right out the door. And, now she is ten and wants her hair to be as long as Rapunsel. So you just never know. OOh, I love the stamp! And those curls. It woulda killed me to cut those off too! Molly- I did free-hand draw and cut this stamp. I used my own scissors as a model and scaled them down... I also stared endlessly at photos of scissors on flickr! Karen- We enjoy using kiss my face detangler for kids. I know the feeling - cutting our son's ringlets was so hard. the print is lovely - you've captured the quality of the scissors -the block printing in the black makes the scissors look three dimensional. I love the sizzors stamp. I am a potter and have wanted to make stamps for quite a while. Can you tell me how you carved this stamp and what materials you used? I would so appreciate your help. Have a great day from Saskatoon, Saskatchewan, Canada. Gorgeous hair, I think I would have been heartbroken too to snip those curls! I've been admiring your projects on flickr, but just haven't had time in the fullness of summer to comment. You have such vision and that other essential quality of jumping in and just trying things!